Welcome to our Classified Ad page. 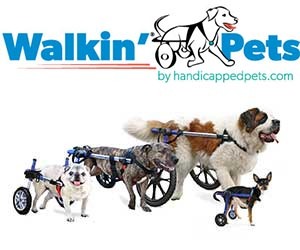 This is a free service provided by Lessons From A Paralyzed Dog to help you sell your gently used dog wheelchairs and dog mobility devices such as harnesses, slings, strollers and ramps. Ads are listed for 10 days and then removed. We strongly recommend that purchase transactions go through a service like PayPal. Ad listings and purchases can only be made by people who live in the contiguous United States. Shipping is worked out between the seller and buyer. Disclaimer: Lessons From A Paralyzed Dog is not responsible for the transactions, negotiations, or conversations between sellers and buyers who use this page. The ad page is provided as a courtesy to ease the financial obligations associated with the care of a disabled pet. If the item you are looking for isn’t listed, here are new products for you to explore.